Ever since I was very young, I have been reluctant to throw out books. I still have Lassie Come Home, a book I remember my mum buying me at a book sale at my primary school library. I have my school English and maths books. In fact, I have every book I have ever bought (except university text books, they have long gone. I quickly realised old editions of text books are useless). I understand the time will come when I won’t have two houses and I will have to cull but, in the meantime, they are safe on my shelves. For some reason, I think if I throw out a book, I will be throwing out a piece of the jigsaw puzzle which is me. It is like there is a mythical person out there who needs to find out who Glenda is and each book and CD (for that matter) I have ever owned is a clue to my identity. Even books I didn’t like will give this mythical person a clue as to who Glenda is and, therefore, cannot be thrown out. So, too, it is with cookbooks. I don’t know how I started to accumulate them but accumulate them I did. Before I knew it, people started realising I liked them and started buying them for me, too. I got more and more. It is not that one needs any cookbooks. One can just go on the internet and find any recipe they want or key in a few ingredients and find tonight’s dinner. Nonetheless, I like cookbooks. Once I have decided to buy a new cookbook, I get all excited in anticipation. If it is coming by mail I get all expectant as the day of arrival draws near or if I am going down to the local shop to buy it, I get all tingly on the journey there. 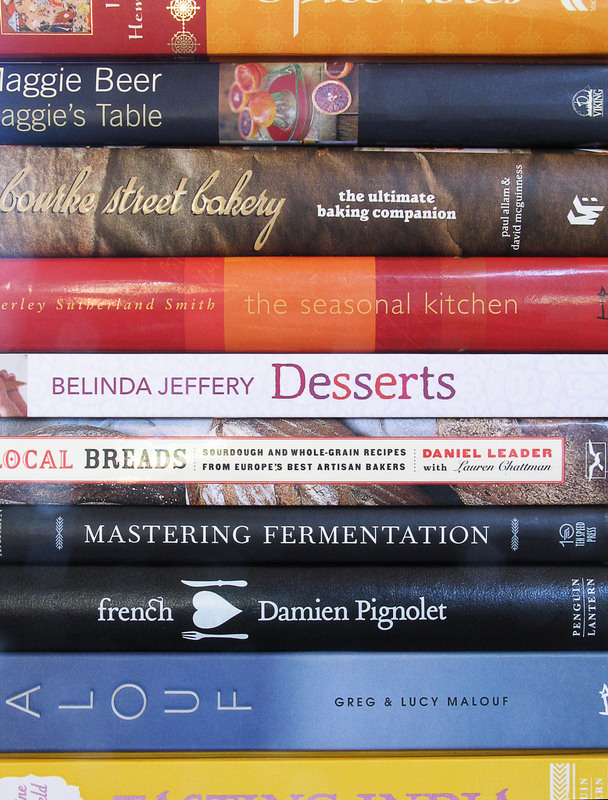 Cookbooks are wondrous things. There are a few missing. I am not at Perth at the moment and know of a couple that I haven’t included but don’t have their full names so I will have to add them later. There may be a few spelling mistakes and missed words but I did my best. Also, the classification may be a bit weird but I had to decide how to classify each book so, please, forgive the arbitrariness of it. I tried to keep all books by the same author together. So what does my list tell me about me? Well, there were definitely a few stages that never lasted, the Vegetarian and Low Fat only scored a few books and they were when I was young and into that type of thing, as all young people tend to be :). Microwaving??? What were we thinking? There were the Chinese and Thai stages which were short lived and Indian phase which has endured. I love that country and its people. There are books galore I bought whilst I was working, as escapism from the daily grind that is corporate life. And there are some gifts that I may never look at but it is interesting that someone who loves me thought I would be interested in them and so they hold a special place, too. There are three books that used to be my mum’s: The Australian Women’s Weekly Cookbook (1st edition) by Ellen Sinclair and Australian Women’s Weekly; Deep Freeze Cookery by Norma McCulloch; and South East Asian Cookbook by Charmaine Solomon. A motley collection in any one’s language. She also had an early edition of CWA Cookery Book and Household Hints by Country Women’s Association but I didn’t score that one in the divvy up :(. The Bread list is very interesting. Homemade Bread by Farm Journal Food Editors is one of my first books. I bought it about 30 years ago. Clearly, I have always been interested in bread making, but my collection has expanded exponentially in the last few years. More time, I think, explains that. The Middle Eastern List is the most fascinating. Greek and Middle Eastern Cooking by Donna Hay and A New Book of Middle Eastern Food by Claudia Roden are two of my first books and they have been regularly added to over the years. I can’t remember why, 30 years ago, I decided to throw a Middle Eastern dinner party and needed books on the subject but my interest in the topic has not waned. I love the food. It is in my soul. I would love to go back to Lebanon if only the troubles nearby would settle down. Anyway here is my list … I would love to see your list if you have one. This entry was posted in Rants & raves and other fun things and tagged A list of cookbooks, Baking cookbooks, Bread cookbooks, French cookbooks, Italian cookbooks, Lebanese cookbooks, Middle Eastern cookbooks by Glenda. Bookmark the permalink. I have nowhere near the amount of cookbooks as you but I have been planning a spot for them in my kitchen, I couldn’t bear to part with them, and I just know there’ll be more, even though I tend to look up recipes on the internet. I love that you have such a collection of Womens Weekly cook books. I have a few too. Classics. Hi Ella. I agree, the Women’s Weekly Books are gems. You better make that a big spot, cookbooks tend to have babies and lots of them. McCalls Cookbook which was given to me by my mother & has a broken binding, pages falling out & has been duct taped many times. And, some of my favorites for just basic cooking are all these local cook books that churches & schools put together as fund raisers. Hi Diane. You should get in contact with the Doc, (see below). He is a collector of those charity cookbooks. I think he has a couple of thousand of them. I bet he would love to hear from you. Wow, a couple thousand – I’m impressed. What I like about them is that they usually have the old family recipes. You’ve touched a nerve. We are on our winter sojourn, to the warmest corner of the southwestern U.S. (Yuma, AZ) – this is on the Mexican border, and so we have been indulging in everything Mex! And in the Mexican tradition, we are enjoying our meals under shaded palapas (so what if they are made of aluminum or canvas instead of palm fronds) out of doors. And that of course reminded me of Diana Kennedy, one of my fav cookbook authors (a transplanted Brit, interestingly!) – it was Diana’s style to immerse herself in the kitchens of her new neighbors until she had learned all she needed to write another book – and her love of the culture, and its food pour forth as you read her wonderful stuff. Love it! Hi Doc, So good to hear from you. How are you and Sandi? My favourite cookbook author is probably Maggie Beer. She is an Australian from the Barossa Valley. Years ago, she and her husband moved to the Barossa and took up pheasant farming. She opened a restaurant and started creating recipes to use the pheasants and their eggs and then other produce they grew. She made quince paste and verjuice standard ingredients in Australian cuisine. She is not even a chef just a home cook with some nous. She has subsequently become very rich and famous and as a result has lost a bit of what made her so good but I love reading her old cookbooks. We’re very well, thank you – currently we are basking in 70ish (F) day temps, while the rest of the U.S. is an ice cube. Only problem is that over half of America’s elderly are here too! Oh well – they don’t go where I go, so no care. I shall look up Maggie Beer on the Alibris used cookbooks, although I suspect that she may be privy to ingredients outside of my reach – I have never in my life tasted pheasant – when found hereabouts, I bet it goes for $40 a lb. Glenda, you could have a goldmine in those cookbooks of yours. Hi Diane, I don’t think so, most books are pretty cheap second hand. I am like you Glenda. I cannot part with books, and I still mourn some of them that I did not get to before my mother threw them out. I recognise some of the books on my shelf in your list. I have yet to start cataloging my EYB list but intend to do so soon. Hi Tania, EYBs is so good. It allows you to search your books for recipes so you are inclined to use them more. Wow Glenda, I am impressed that you made a list! I have begun to catalogue mine via EYB. You have some interesting titles there! Hi Liz, I copied a lot of them from EYB, it still took a long while but it is interesting to see what you have and to categorise them. What is your user name in EYB? I would love to see what you have. What a comprehensive library you have! Which is the one book you couldn’t do without? I prefer to cook from the heart, I feel too constrained by following recipes, but I use my books constantly for inspiration. We have at least 25 titles and a love of India in common. Hi Sandra, I must admit I am big on the Belinda Jeffery books, she makes things you are likely to have for dinner. I am also a big fan of Maggie Beer, probably more in the past than the celebrity version. I used to love the way she came up with recipes to use the things she had growing in the Barossa.